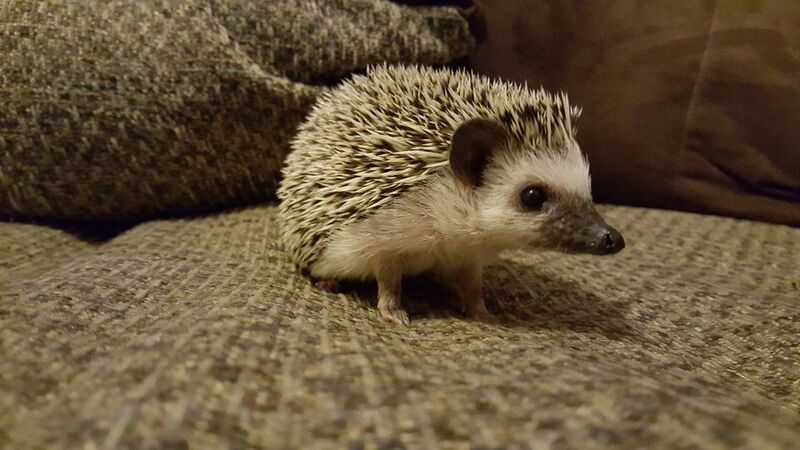 African Pygmy hedgehogs are more popular than you may think and they are more than just a caged pet. Hedgehogs are prone to several serious diseases, some of which can be avoided. While there isn't any hedgehog health census tracking every disease of every pet hedgehog, these are some of the most prevalent diseases we see in our spiny friends, in no particular order. Hedgehogs have up to 44 teeth in their tiny, V-shaped mouths. These teeth are like miniature versions of our teeth and are prone to similar dental issues. Fractured teeth, abscessed teeth, gingivitis, and tartar accumulation can all cause problems in our little hedgies. Preventing any dental issue is of course ideal but not always practical in a pocket pet that likes to roll his body into a spiky, hissing ball. If you can get lucky enough to gain access to the mouth of your spiky friend, then you might be a mealworm. No seriously, if you can get a Q-tip into your hedgie's mouth then brush away with water and work on keeping those chompers shiny. If brushing your hedgehog's teeth is futile then be prepared to have a dental cleaning with possible tooth extractions performed at some point in your hedgehog's little life. Spaying female hedgehogs are something that should be done for more than just hedgehog population control. Uterine cancers, an infected uterus called pyometra, and mammary tumors can all result from your hedgehog hanging onto her reproductive organs. These diseases can all be prevented by having an ovariohysterectomy performed on your female hedgehog at about six to eight months of age. Neutering male hedgehogs is also key to preventing testicular cancer and can also be done around the same age as the females. Hedgehogs will lose some of their quills as a part of their normal shedding but if your hedgie is itching and scratching and you are finding more quills on the bottom of the cage, then your hedgehog he may have an ectoparasite. Mites are one type of commonly seen ectoparasites on hedgehogs and will cause your hog to be itchy. Quills will fall out, the skin will dry out, and your hedgehog may be more irritable than normal. Mites can be diagnosed by your exotics vet (find one near you) by performing a skin scrape on your hedgehog and then looking for the tiny mites under a microscope. This test is not 100% fail proof though since only a small area of your hedgehog will be scraped so your vet may decide to treat for mites even if he doesn't see any under the microscope. Mites can be brought into your hedgie's home by way of bedding and food. Therefore, it is important to always freeze these items before putting them into the cage. Commonly referred to as "wobbly hedgehog syndrome," hedgehogs can develop a neurological disease that causes them to, well - wobble. Ataxia progresses to falling over, being unable to right themselves, seizures, and eventually paralysis with many other symptoms in between. It is a sad disease that no hedgehog should ever have to go through but reportedly affects about 1 in 10 hedgehogs. There is no known cause but a genetic predisposition is suspected, and there is no cure. The bladder holds urine (tiny anatomy lesson here) that is supposed to be clear to yellow. But sometimes hedgehogs develop a urinary tract infection or cystitis, both of which can cause the urine to be brown or bloody. Urolithiasis (bladder stones) can also cause hematuria (bloody urine) and may make it difficult for your hedgehog to urinate. A urinalysis, culture, radiographs and a bladder ultrasound will all aid in diagnosing the urinary tract disease of your hedgehog. Kidney infections, bladder tumors and other diseases of the urinary system are also seen. Many other diseases exist and can be diagnosed by your exotics vet. Ear infections, obesity, allergies, enteritis, osteoarthritis and other ailments can all occur in your hedgehog. Therefore, an annual physical examination is recommended to keep your hog as healthy as possible for as long as possible.